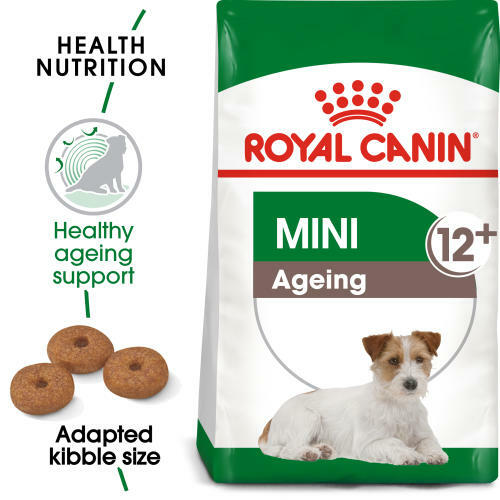 ROYAL CANIN Mini Ageing 12+ Senior Dry Dog Food is both scrummy and nutritious! Suitable for small breed dogs over 12 years old that weigh up to 10kg, ROYAL CANIN Mini Ageing 12+ is specially formulated with all the nutritional needs of your small dog in mind. Developed to specifically support healthy ageing in small breed dogs, this formula contains highly beneficial Omega-3 fatty acids such as EPA and DHA, as well as an exclusive complex of antioxidants that help to neutralise the effects of free radicals. ROYAL CANIN Mini Ageing 12+ is also developed with an adapted phosphorus content, this helps to support and maintain healthy kidney function in your dog as it ages. This formula also help to support and maintain the good condition of your dog’s skin and coat. To cater to each dog’s individual preferences, ROYAL CANIN Mini Ageing 12+ is also available as wet food in delicious gravy. If you’re considering mixed feeding, simply follow our feeding guidelines to ensure your dog gets an accurate amount of both wet and dry food for optimal benefit. Healthy ageing support - Developed to support healthy ageing in small breed dogs. Contains EPA, DHA and an exclusive complex of antioxidants to help neutralise free radicals. Renal health - Developed with an adapted phosphorus content to help support healthy renal system in ageing small breed dogs. Coat condition - This formula contains nutrients that help support a healthy skin. Enriched with EPA-DHA. Additives: Vitamin A: 30200 IU, Vitamin D3: 800 IU, E1 (Iron): 46 mg, E2 (Iodine): 4.6 mg, E4 (Copper): 9 mg, E5 (Manganese): 59 mg, E6 (Zinc): 178 mg, E8 (Selenium): 0.1 mg - Technological additives: Pentasodium triphosphate: 3.5 g - Preservatives - Antioxidants. *L.I.P. : protein selected for its very high assimilation. Composition: Rice, maize, dehydrated poultry protein, maize flour, vegetable protein isolate*, maize gluten, animal fats, hydrolysed animal proteins, minerals, beet pulp, fish oil, vegetable fibres, tomato (source of lycopene), soya oil, fructooligo-saccharides, hydrolysed yeast (source of manno-oligo-saccharides), borage oil, marigold extract (source of lutein). Crude ash: 5%. Crude fibre: 2.1%. Crude oil fats: 14%. Moisture: 0%. Protein: 26%.